Ultra Boost shoe was designed for runner and features Boost technology that provides better energy return for runner. For some reasons, it is right to say the NMD R1 is the another version of the Boost shoes that is made as a lifestyle sneaker except it cannot perform as Boost shoes when it comes to running for a long distant. 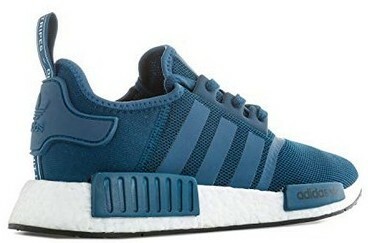 The Adidas NMD R1 is the first version of Adidas NMD line of shoe that was released in 2015. Before going into telling you some important features of the NMD R1 and how good or bad the shoe is, I will first like to let you know a brief story behind the making. Lets me start by saying Nic Galway is a veteran that works as a designer for Adidas. He wanted to design a shoe that is very culturally minded; the shoe that can be used mostly for lifestyle, traveling and cruising urban cities; the shoe that has no boundary for daily wear. The NMD means nomad. Google defines nomad as a person who travels from place to place. This is the purpose Nic Galway wants the shoe to serve. It’s not a shoe designed for sport, but the one specifically designed for nomadic lifestyle. The Retro sneakers such as Rising Star, Boston Super and Micro Pacer are the ones that inspired the NMD R1 shoes. NMD R1 was launched in 2015 and has become one of the most Adidas sought-after lifestyle sneakers since then. 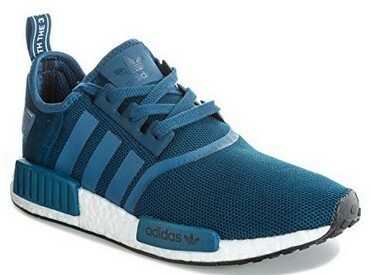 It is the first model released in the line of NMD shoes. Truth be told, the shoe will always do well in comfort but not in performance. So if you need a comfortable shoe for your daily wear or traveling, the NMD R1 might be a good option for you. NMD R1 was released as a comfortable stylish shoe for urban cruising. The shoe is available in different colourways. What many people love about it is the look and the design. It looks exactly like a running shoe – just a flash of Ultra Boost look. So, there is no doubt that it was inspired by running shoes. Though it is not designed for sport, it can be good for light training. Also, the NMD R1 pairs can easily go with any type of outfit, bet it jeans or any type of casual pair of shorts. Either you are a man, woman, girl or boy, you will definitely find NMD R1 style that suits you best. Primeknit is one of the Adidas cutting edge technology that can be found in the NMD R1. It gives the shoe a real model look in the upper. When you look at the new version of NMD R1, you would notice rib-like design lines that run from the toe box to the end of eyelets. This new feature can be found in the NMD R1 STLT Primeknit version. I’ve read that this provides more support, but I think it also helps the upper looks great as well. The shoe has no lining or reinforcement. So the elements on the upper are there to provide some level of support to the primeknit. 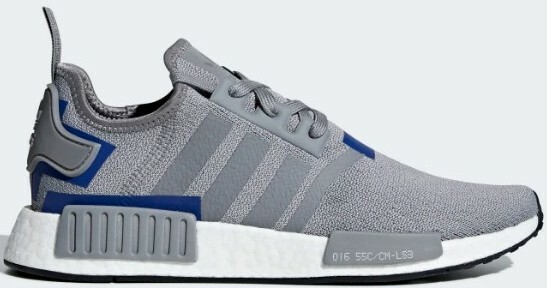 The old version of NMD R1 has the Adidas branding on the tongue tab. 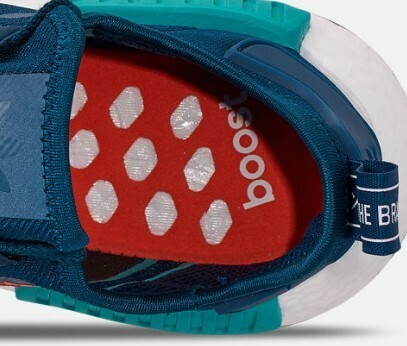 On the heel, there is a pull-loop that has “The brand with The 3 Stripes” printed on it. The pull-loop is supported by the rubber heel counter, sometimes called heel moustache. The rubber heel counter also has the Adidas branding on it. This heel counter is there to provide some reinforcement to the heel tab. Look closely, and you will notice a stretchy sock-like upper which enables easy wear and provides amazing feet. The NMD R1 has rubber outsole. The outsole was designed in the best Adidas way to provide the right amount of traction for everyday wear. The traction can function well on either a dry or wet floor. According to Nic Galway, the holes on the sole are not just there for decoration. They are there for a reason which is to allow the Boost to move freely and thereby providing the best energy return. The LEGO-like blocks on the outsole serve a specific purpose which is to provide supports in the Boost foam. 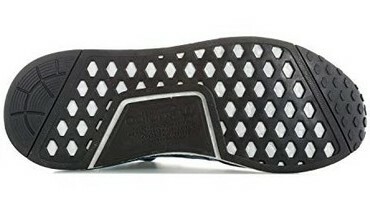 What you can also find on the rubber outsole is the Adidas branding which gives the trainer another good look. The well-known Boost cushioning technology can be found in the midsole. The midsole of the new NMD R1 can still be traced back to the NMD R1 2015 version. There is nothing change so it still provides the same feeling. The EVA stability plugs are another distinctive features incorporated in the midsole. The Adidas NMD R1 has no insole. This makes the wearers feel the comfort of the Boost cushioning in a whole new way. Also, I think it helps create more space. So there is more room for people with big feet. The NMD R1 has been on the market since its released in 2015, and is still one of the most popular Adidas lifestyle sneakers. The Boost cushioning and the Adidas Primeknit technology used in the shoe are the important features that catch people attention. Both sneakerhead and non-sneakerheads love it for its amazing comfort, style, and the overall quality. Leave a comment. Have any question? Please ask. I like the background story that you provided! I didn’t realize that was what NMD stood for. 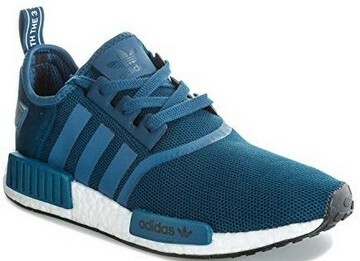 I had looked into purchasing a pair of NMD’s a few months back but ended up backing out because I wasn’t sure how long they would last when using them for running. I don’t do heavy training but have always stuck with nike. How long would you say the shoes would last with light training instead of daily wear? I’m glad you asked. Nike is indeed one of the best brands out there. Since you don’t do heavy training, the NMD R1 will definitely last longer when used for heavy training. Some dudes do use it for light training, but I can’t tell exactly how long it will last. What I can say is it depends on the level of your light training. If you want to use it for running, I can recommend Adidas Ultra Boost for you because Ultra Boost and NMD are approximately the same price. Please let me know if there is anything else I can help with. There are so many kinds of shoes out there; the information can be overwhelming. Thanks for the helpful post! Good review! Been looking at getting a pair of these for a while and will need some new running shoes after the winter, thanks for giving me some options, and an honest review! There’s so many different kind of shoes,from cheap to expensive,but having a good reviews makes the costumer to think about.Thank you for very informative article. I have always preferred the comfort of Adidas shoes. I have to admit that I am a bit over the top when it comes to sneakers. I own over 25 various brands of sneakers but the NMD-R1 is basically a decent everyday shoe in my opinion. Thank you for the detailed review of this product I will be visiting again soon to check out what’s new. Have I just found the perfect shoe? The NDM R1 sure looks like the perfect shoe to me. I’ve been wearing the Nike SB Portmore II Solar, and love that shoe…but wanted something a little more casual looking. I absolutely love the fabric and how it looks. They are also right in line with the price of the Nike so that is a win! Anyway I have been a Nike man for years. Thanks to your review I think I will have to give the Adidas a shot! Only problem now is picking the color! I did a little more digging and noticed some users complaining about the insole. Would you recommend an insert for these shoes and if so, any idea which one is best? Thanks for your question. If I were you, I would first try the shoe without insoles. If I don’t feel comfortable without insoles, I would not have a choice than to get some insoles. Superfeet Carbon is one of the best insoles out there. I think that should be just fine. However, the Carbon is a bit expensive. There are some cheaper ones you can get on Superfeet site. The material upper is textile. It’s lightweight and tough at the same time. The Adidas primeknit technology perfects the shape. It seems like the shoe can go more than a year without anything happening to the upper. Great review. I had never heard of NMD. I love the look of these shoes and the fact that there are so many different choices of colours and styles. The boost cushioning and the primeknit technology sound like an excellent addition to these shoes. I do not use them for running or training but I do really need a great pair of comfortable shoes that will last.Do you have any idea if these are comfortable and long lasting for people with flat feet like me?I have always had some trouble with shoes because of having flat feet. Do I need to get special shoes made just for people with flat feet or woulld a shoe like this be good for me? Thanks for the question. I did a little digging about the shoe that’s best for flat feet. Some of the considerations are: Make sure the shoe isn’t flexible to bend easily in the middle when you try to do so; Good heel counter; It must not be too flexible to easily bend left and right. New Balance MW577 Walking Shoe is one of the shoes recommended for walking. I will say the heel counter in the NMD R1 provides some level of support for the heel. the cushioning should do well for your arch support. Also, I checked a website where there are discussions on the types of shoes for flat feet. Some of those people do recommend NMD R1. You can have a look at the site here: Shoes for Flat Feet. I also find out podiatrists/doctors will do well in offering the best advice. The contents in this site may contain affiliate links of the products being reviewed or recommended. I may receive commission if you clicked the links. This will not have any effect on the price of the products. See the Affiliate Disclosure for more information. For Kicks Sake, All rights reserved.